server, you cannot create again. 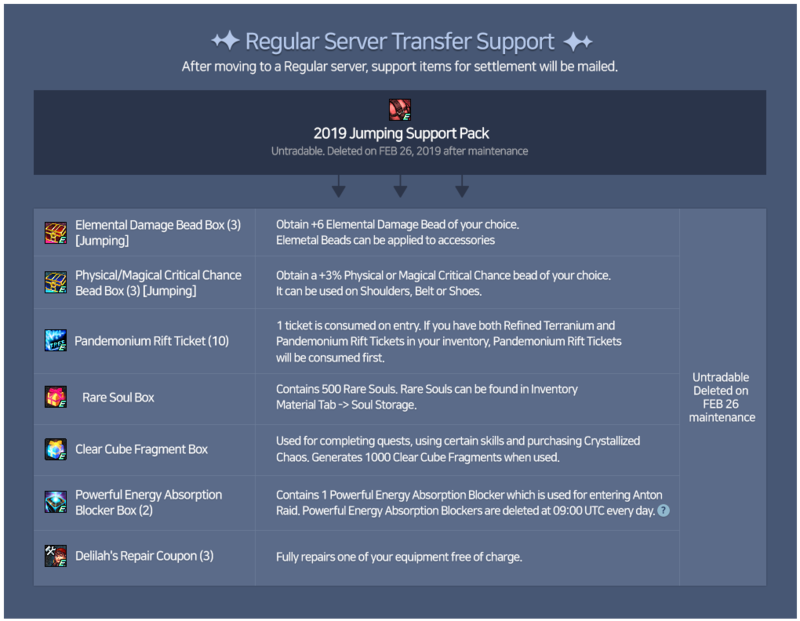 Please click here to see supported content on the jumping server. 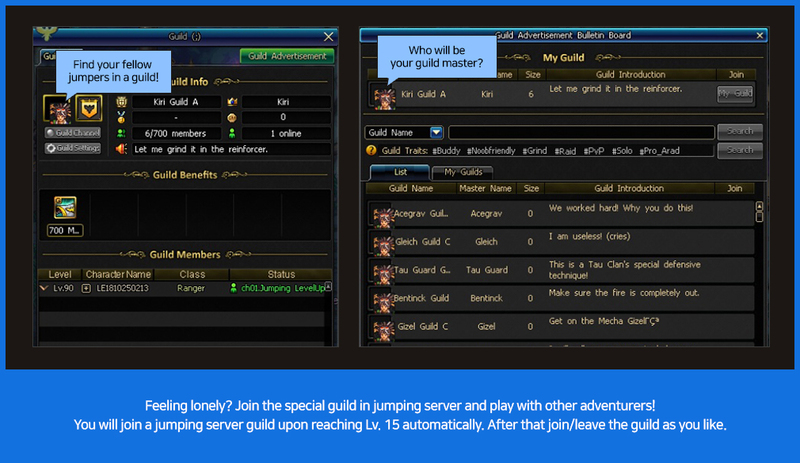 Adventurer Maker event is not available on the Jumping Server and you cannot earn activity points. Stage Dungeons consume FP and you will earn mileage from clearing it. Stage Dungeons do not have dungeon clear card reward. Interdimensional Rift, Anton Tutorial/Intro mission stage dungeons do not consume FP on entry. They do not count as Optimal Level Dungeons and you will not earn mileage from it. 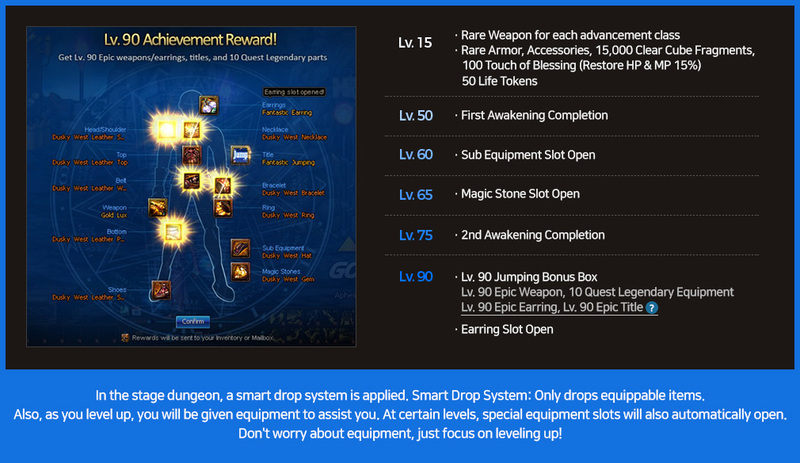 Once all dungeons in the farming guide are cleared, you may move to the regular server. Dungeon clear record is shared by account. Items given for reaching Lv. 90 are sent to your inventory and they cannot be traded or disassembled. Lv. 85 achievement reward that exists in Regular Server will not be given in Jumping Server. What is smart drop? It only drops equipment that can be equipped by you. Please see below for details. Normal Monsters: +0 to +10 Reinforced Sealed Rare Equipment / Boss Monster: +7 to +10 Reinforced and +0 to + 3 Halidom Unique Weapon. 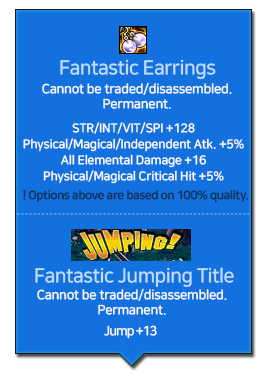 Only one of the jumping server characters can take epics, so please choose wisely! 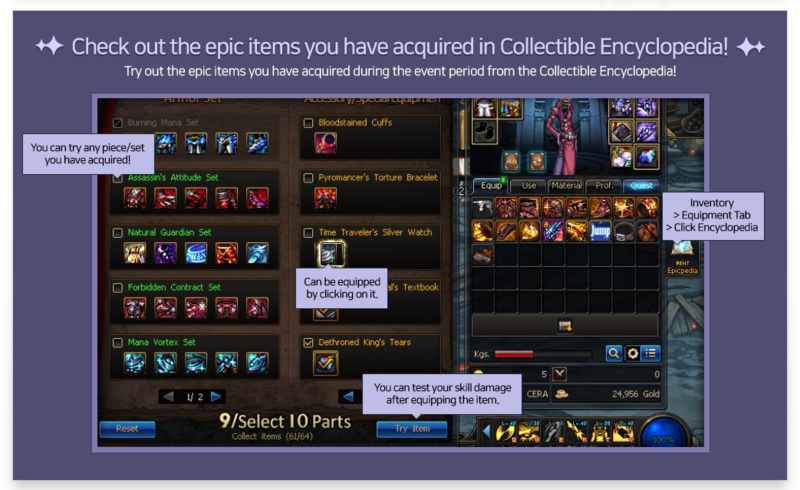 All epic items obtained from the event cannot be disassembled. 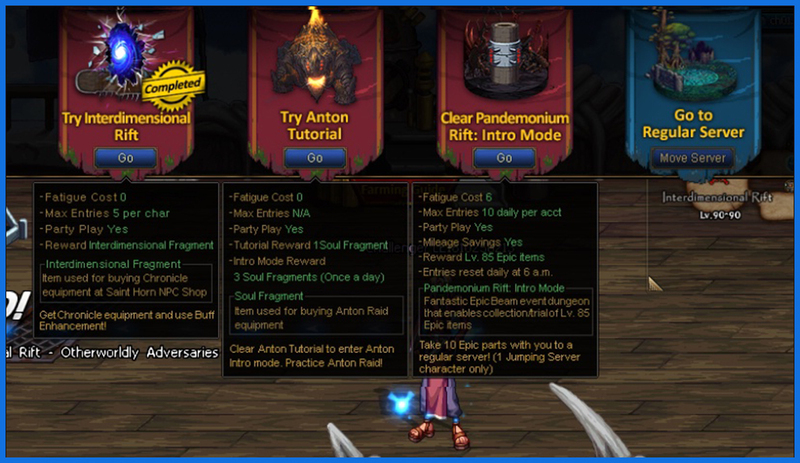 Pandemonium Rift: Intro Mode dungeon can be entered 10x per account/day. Entry count resets at 09:00 UTC every day. Pandemonium Rift: Intro Mode dungeon consumes 6 fatigue on entry. 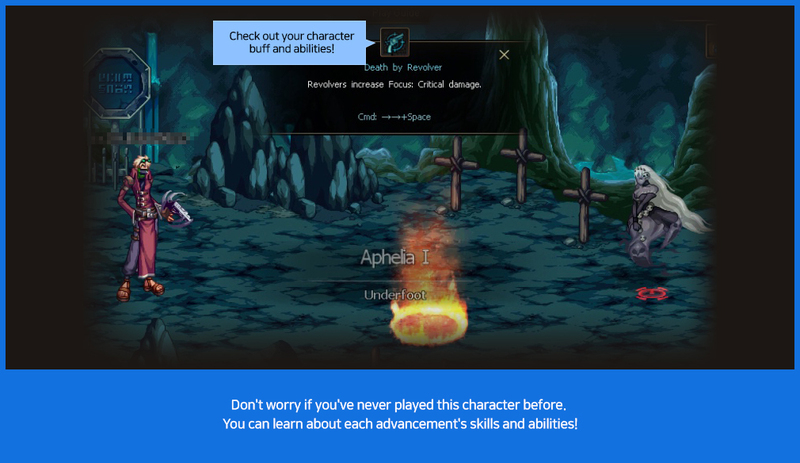 Pandemonium Rift: Intro Mode dungeon is an optimal level dungeon. You will acquire mileage when you clear it. Collectible Encyclopedia is shared by all characters in your account. Only one of the jumping server characters can take epic items to the regular server. The grade of Epic item transferred to the regular server will change randomly. During the server transfer period, you can move to a server you wish. 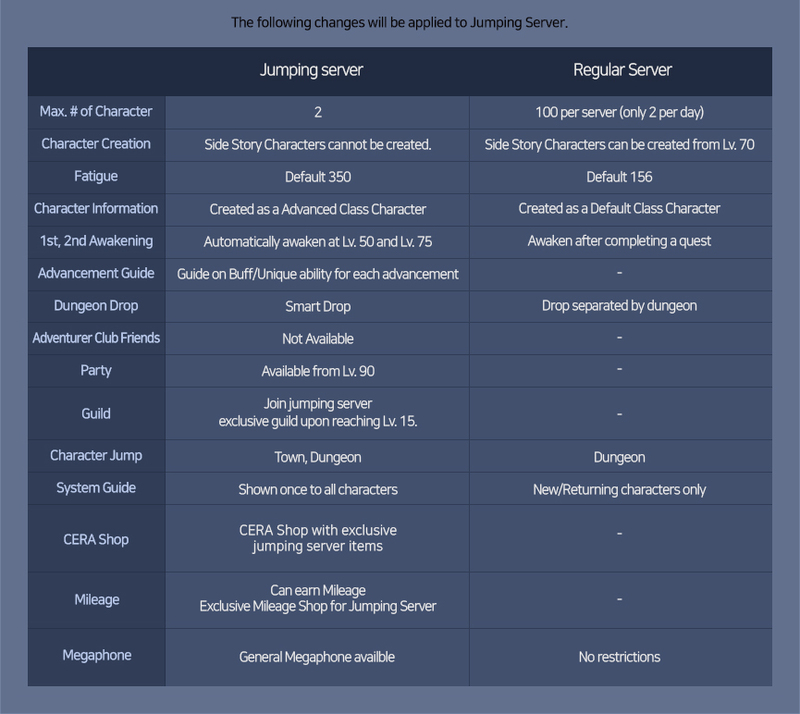 You can only transfer up to two characters from the jumping server. 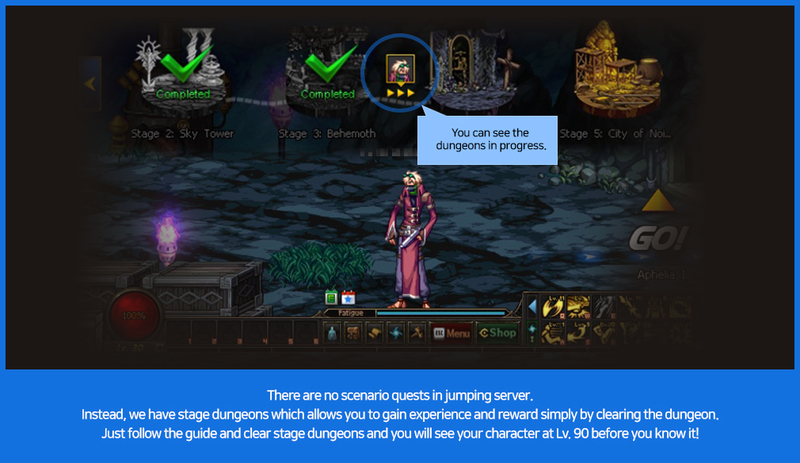 Only 1 of the characters from the jumping server may select 10 epic items obtained from Pandemonium Rift: Intro Mode and move it to the regular server. Gold, cube fragments, and souls are not transferred when you transfer to the regular server. You cannot transfer if you do not have enough character slots on the regular server. After transferring servers, you may login after changing the character name. After moving to a regular server, support items to help you settle in the new server will be sent to your mailbox. 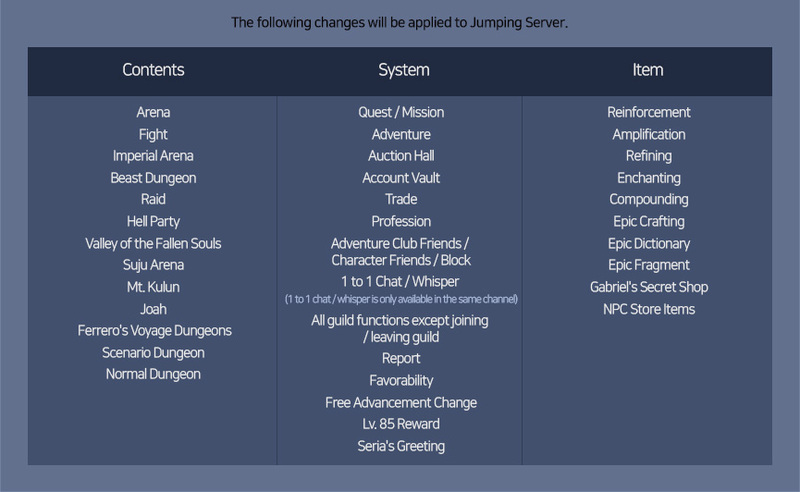 When an account created after JAN 18th transfers their character from jumping server to a regular server, their account will become trade-restricted. 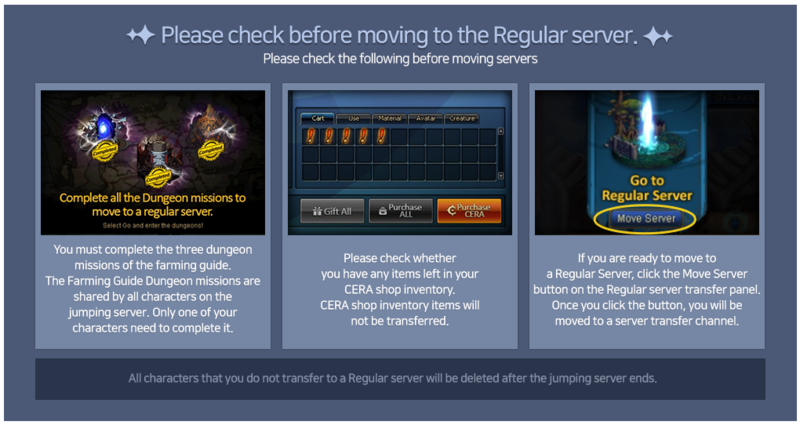 New users must clear Seria's Support 1 and 2 quest in order to remove their trade restriction. These quests can be received at Lv. 90. Powerful Energy Absorption Blocker Box can be purchased from the Raid Shop as well but you can only enter Anton Raid once per day. If you have already have a Powerful Energy Absorption Blocker, be careful not to purchase more.